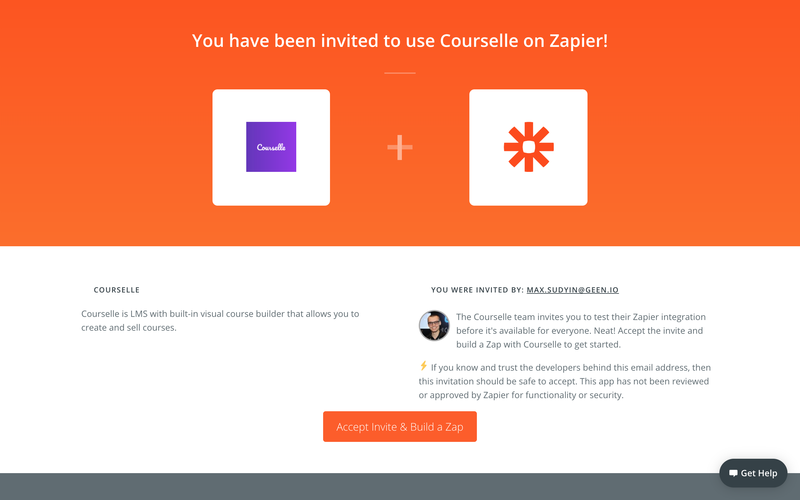 Zapier is a tool that allows you to connect apps you use every day to automate tasks and save time. You can connect any of 1,000+ integrated apps together to make your own automations. What's more it's quick and easy to set up - you don't need to be a developer, anyone can make a Zap. Every app on Zapier provides Triggers, Actions and Searches that you use to build your Zaps. A Search is a sub-type of Action that finds an object in a system using provided input criteria. For example, if you have an email address in the Trigger output and you want to find a contact in the CRM system to perform another Action with that contact, you would need to perform a search "Find Contact by Email". Read more about how Zapier works on the official website. 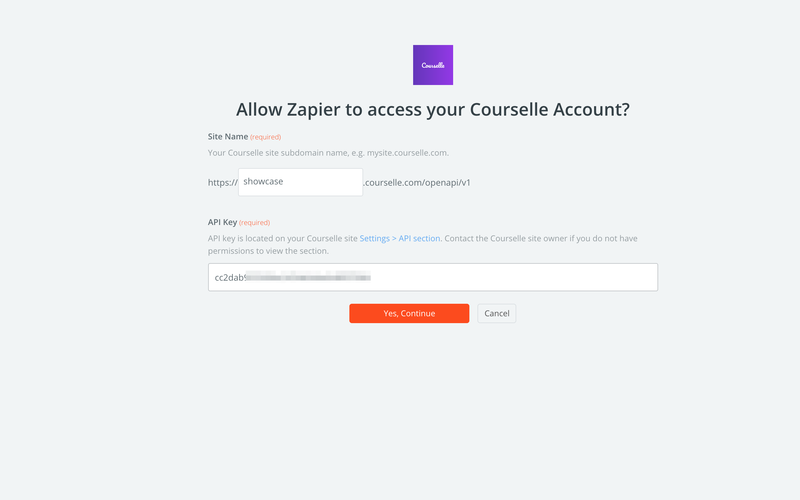 Admin/owner permissions – you would need to have administrator role or its equivalent (if there are custom roles configured) to integrate Courselle via Zapier. 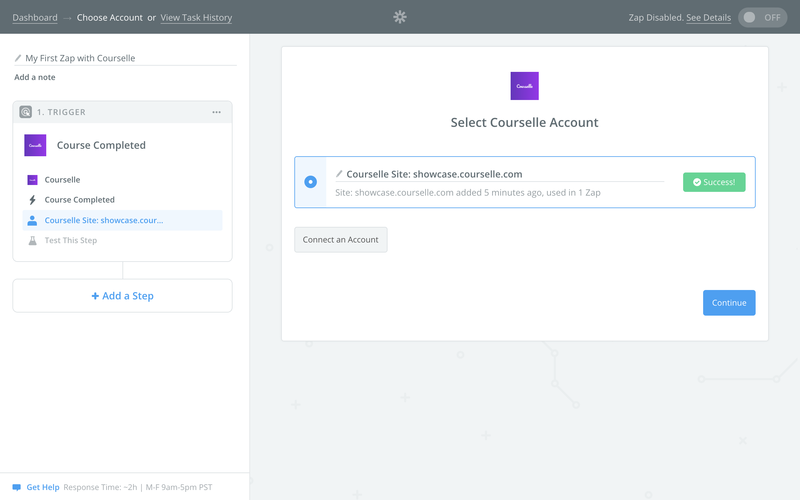 Paid/free version – no restrictions here, you can be on any plan with Courselle to access its integration features. Custom fields support – Yes! you can use custom fields for users, courses and groups in both Triggers and Actions. Choose a trigger you'd like to test (e.g. Course Completed) and proceed to connecting the account. If the address is mycompany.courselle.com you would need to enter mycompany. You can find the API key on your Courselle site in Settings > API tab. Pull the samples and proceed to creating the action step. 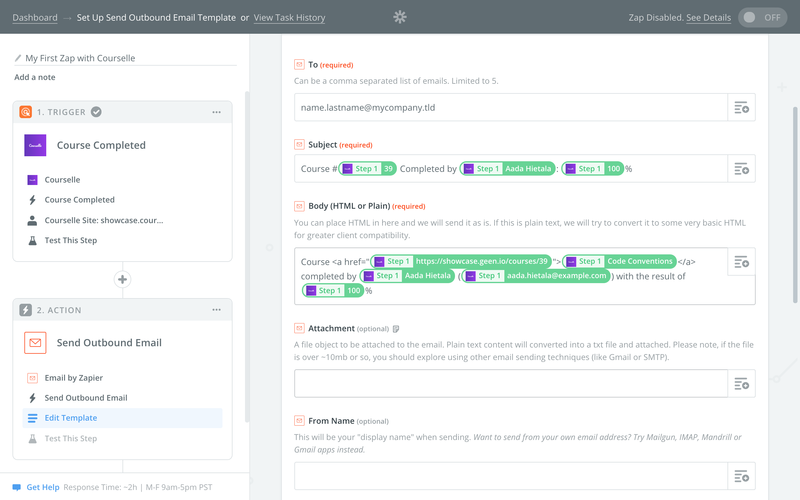 For the ease of testing, let's use "Send Outboud Email" by Zapier – just send the email with all the details from the Courselle trigger's output. If you'd like to keep the Zap working, turn it on and proceed with creating another Zap. Which Courselle Triggers, Actions, and Searches are supported? Course Published – triggers when a course gets published and becomes available to learners. Course Unpublished – triggers when a course gets removed from publication and becomes unavailable to learners. 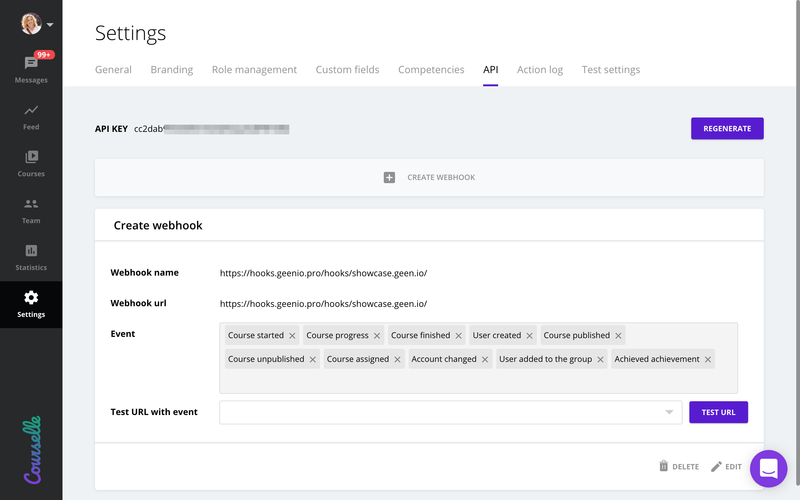 Course Assigned to User – triggers when a user gets a new course assignment. When multiple users are assigned with multiple courses, each pair user-course fires a separate trigger. 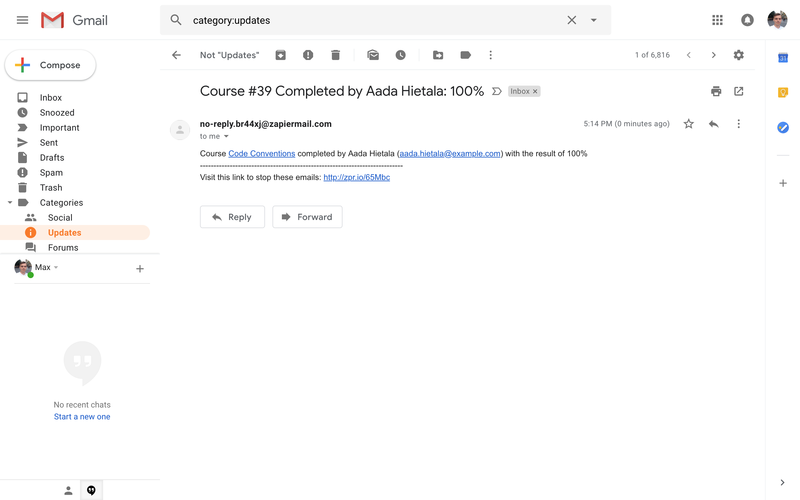 Course Started – triggers whenever a user starts taking a course. HEADS UP! This event happens very frequently, so you should consider your task limit when enabling this trigger. 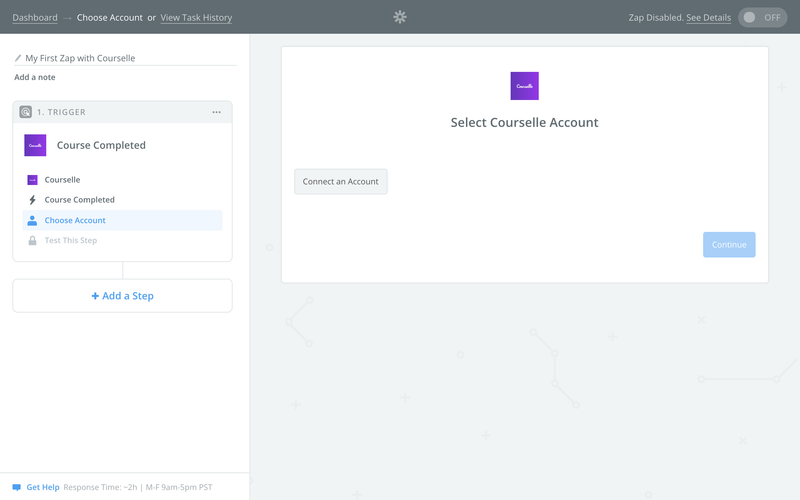 Course Completed – triggers when a user completes a course. New User Created – triggers when a new user account gets created. For users invited via email, the trigger fires when the user accepts the invitation. For users manually created in the system either via UI or via API the event triggers at the moment of creation. User Properties Changed – triggers when user properties get updated. User Added to Group – triggers when a user gets added to a group. Invite User via Email – creates an invitation to your Courselle site, where you can pre-configure user role, group memberships, course assignment and deadlines, as well as the invitation message that will be used in the email. The user account will be created only after the user will accept the invitation. Create User – creates a user account with configured parameters and attributes. Unlike invitation, the user account will be created right away and the user will receive the email with login information to the address provided during creation. Block User – deactivates a user account to prohibit the user from using the system and free up one seat from the license. Unblock User – activates an account to let users access the system. Add User to Group – adds a user to a group. It's possible to add multiple users to a single group. Assign Course – assigns a course to a user. Find User by Email – finds an existing user account with the provided Email. Find Course by ID – finds an existing course by its ID. Find Group by ID – finds an existing group by its ID.